Texas divorcée Kimberly Santleben-Stiteler would like you to know that she don't need no man. After formalizing the terms of her divorce last week, she drove a nail into her marital coffin with a party on Saturday night. And because it was her party and she could cry if she wanted to, she gathered together 40 of her closest husband-hating confidantes, and proceeded to blow up her wedding dress in an explosion that was felt as far as 15 miles away. It's probably safe to assume that Ariana Grande's "Thank U, Next" was playing. “I had a lot of advice and suggestions from friends and family, like donating it for premature babies and baptism gowns. However, to me, the dress represented a lie," Santleben-Stiteler told local news. 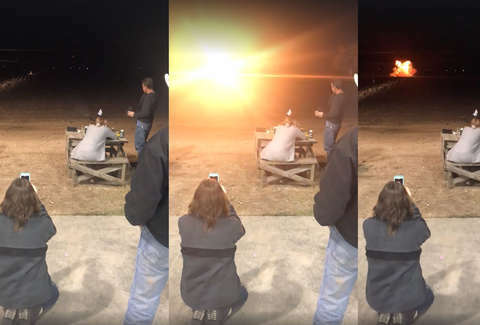 Rather than simply set fire to the dress, as one typically does at their own personal divorce banger, Santleben-Stiteler and her father rigged the gown with 20 pounds of Tannerite -- an explosive substance most frequently used for firearms training. In short, they decorated the dress with an array of exploding targets. “We have a friend who is a bomb tech and he kept saying, ‘that’s really a lot,’ like five different times when we told him our plan, so we had to back it up,” Santleben-Newport said. Fortunately, when Santleben-Stiteler aimed her gun at one of these targets, she nailed the first shot. Apparently, she's no stranger to firearms, which should probably come as no surprise from a woman who has Tannerite on hand. “We were all getting messages asking if that was our explosion people were feeling and hearing around the county, up to at least 15 miles away,” the former bride's sister told reporters. It was, in fact, "really a lot." As it turns out, you should always listen to your bomb technician friend when incinerating your former wedding dress, just as a rule of thumb. “It was liberating pulling that trigger. It was closure for all of us,” Santleben-Stiteler said, once the party subsided. A healthy form of closure, indeed.